How funny that I read this post just as the rain started pelting down outside!! 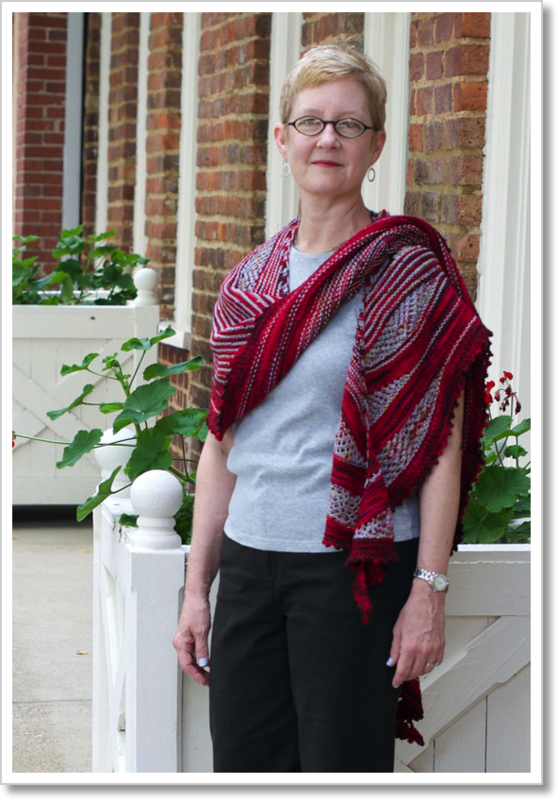 I’m not a shawl wearer, and one of the things that puts me off is the item not staying on – so this sounds like a good pattern to try if I got tempted by shawls. I especially like the colours you’ve chosen for this second version. And I totally agree with the statement that when knitting I can withstand conversations that make me squirm with restlessness! It’s so YOU! Your colors, for sure. I need a shawl-wearing lesson. I can’t keep mine on :-(. Dammit, now you have me wanting to knit another one for myself. LOL My green one is a little smaller but I still love it but that red is just stunning. It really is a satisfying knit but I’d say the same for the Fade. It’s easy to memorize and you can zone out while knitting it. Plus you’ll get excited for each color change. Hahahaha!!! Well, that would serve you right since nearly everything you knit goes to the top of my queue. LOL! Seriously, I’m glad to hear that about the Fade. It’s nice to have it out there on the horizon. Lately, when I need a break for work, I spend time thinking about yarn combinations, so I’m sure it will happen before too very long. That turned out absolutely gorgeous! The colors pop on you and look so good. I do not mind when a blog changes up their look…unless its to something that doesn’t look better or makes it more difficult to get around 🙂 I’m headed to Ravelry to see if I’ve put this delightful shawl in my queue or favorites and if not, it’s going in immediately! Oh dear me, I love your version of this shawl! I knit Waiting for Rain, but I like the asymmetry of yours–and those colors!! Thank you so much, Melissa, and thank you for stopping by! The colors got me as well. If anything, they’re even more gorgeous in person. I can’t wait to knit something else with Hedgehog Fibres yarn. That’s a very pretty shawl 🙂 Love the colors and texture.